One of the swankiest hotels in town, the four star Hôtel des Milles Collines (or hotel of a thousand hills, which is how Kigali is sometimes described) is strangely enough, not located on Avenue des Milles Collines, but rather on the Avenue de la Republique. Rated 10 out of 42 Rwanda hotels on www.tripadvisor.com, it is one of the most expensive hotels in Rwanda - around AUD200-300 a room, although some websites go as high as $400+! A far cry from my favourite Rwandan lodging, the Step Town Motel, at USD50 a night. Since I was in Kigali, it seemed a shame to miss out on the opportunity to check out this iconic location, which was featured in the Hollywood movie Hotel Rwanda; so I popped in for lunch. Set within a walled compound, the hotel is very nice inside, once you get past the stern old-world (perhaps 1970s?) external architecture. 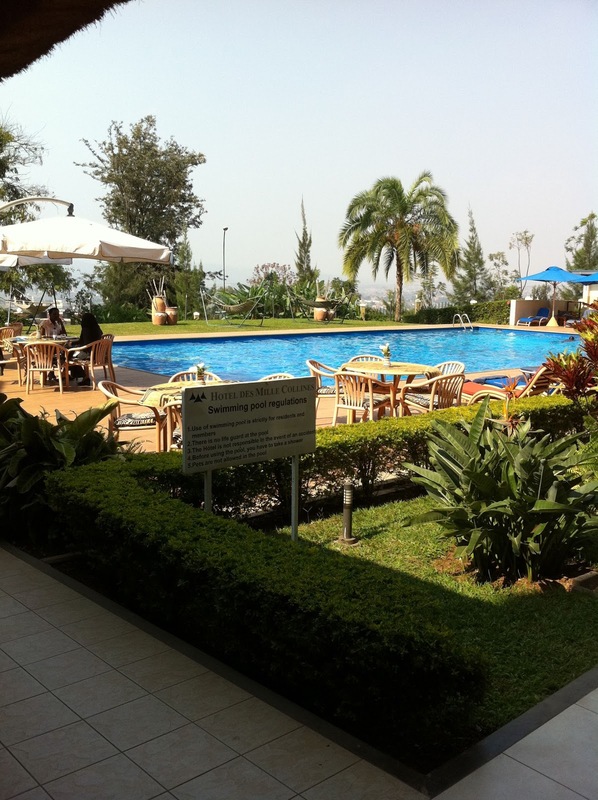 I was ushered by a solicitous hotel attendant to the poolside bar/restaurant area, which is set at the edge of a hill overlooking Kigali. I of course opted to sit at a high table in the bar area to enjoy the view, and ordered a martini to slake my thirst. Interesting style – less dry than I would have expected, but with a sweet hint of rose petals. In Africa, you learn to be patient, because everything takes a little bit longer. But to my pleasant surprise, the menu said that if the meal doesn’t arrive in 15 minutes, it’s free. While it’s nice to know that you don’t need to starve while someone in the back of the kitchen chases after the lifestock, the thought of pre-cooked pret-a-manger food did worry me a bit. However, the helpful waitress showed me the 3 choices for the business lunch (literally the 3 dishes on a tray! ), and I chose the chicken, unsure whether I would be given that plate. Fortunately, she went away to the kitchen with my order. The meal ain't haute cuisine, but still tasty and I polished it off in short order when it arrived. At Rwf5,500 (less than AUD10) for lunch, and only having had to wait a few minutes for me meal, I certainly had no complaints – I thought that this was in fact good value. 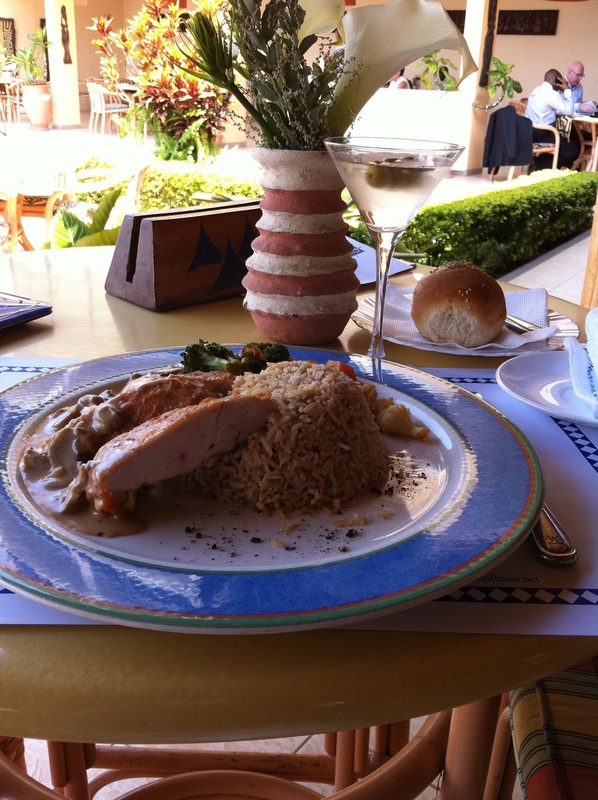 Funnily enough, my martini cost as much as the meal itself. Compare than to the price of a beer (even imported well-known brands cost the equivalent of AUD1-2). So there you go – Hôtel des Milles Collines –expensive rooms, but very reasonably priced meals, and a nice respite from the hubbub of a busy African capital city.